Precedent: Four storey academic building height. Generally, for academic buildings, a four storey maximum height benchmark is applied. This height limit maintains efficiency in classroom structuring, programming, and accessibility. There are opportunities for additional height beyond four storeys, to accommodate non-academic uses such as student residences, offices, or third party uses such as incubator partnerships. Additional building height also allows for landmark and gateway treatments, for wayfinding and framing views, and to maximize the Campus’ visibility from internal and external streets, and the surrounding neighbourhood. The height and massing of buildings must be carefully considered and situated because of the intimate scale of the Campus, to respect the prominent heritage fabric, and to respect the low density residential neighbourhood context. 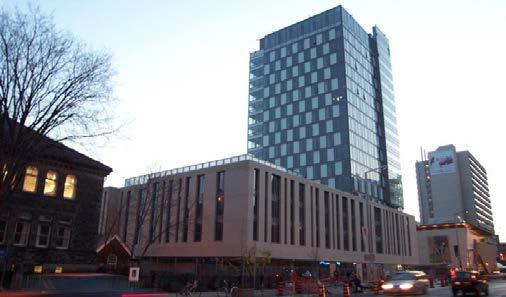 As such, taller buildings (8+ storeys) should be located: either in the interior of the Campus, allowing for a transitioning down in height towards the Campus edges, and towards existing prominent heritage buildings; or along the major arterial roadways (18th Street and Victoria Avenue). Opportunities for moderate building height (4-8 storeys) can be located at key gateway entrances into the Campus, primarily along 20th Street where the street or back laneway provides a buffer or transition to the neighbourhood, and where additional height does not have an adverse affect on adjacent buildings and open spaces. As in height, the scale and massing of buildings (the size of buildings) must be designed to provide a respectful adjacency to other buildings and open spaces so that they do not over power other buildings, or create uncomfortable open spaces. 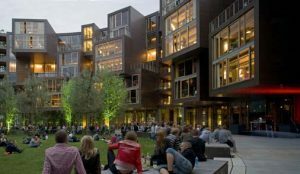 Buildings must be designed and sculpted to create a comfortable, “human scale” experience in the public realm, and to allow for physical and visual permeability through the campus. The scale of a building needs to be balanced with the size of surrounding or adjacent open spaces. This is why it is important to develop buildings together with new adjacent open spaces as the campus unfolds. The “human scale” makes reference to the experience of the building mass in relation to the size of its users. 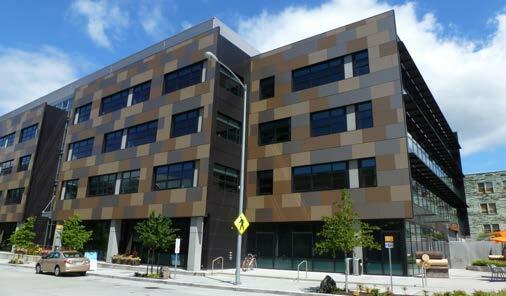 Buildings, and the elements that constitute their façades should have a proportion and scale that is welcoming. For example, the relative size of a door, a window, or a staircase should be proportioned with the scale of users. 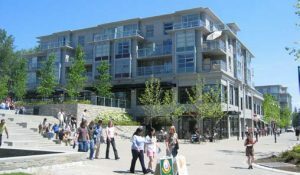 Human scale is most important in areas that are accessible or visible from the public realm, such as the first few storeys of a building facing a street or an open space. Buildings on the Campus should be visually divided into a hierarchy of building volumes, have building frontages that introduce a pattern of doors and windows, and have a ground level that is transparent and animated. Of this hierarchy, the design, use, and animation of the ground level of buildings are the most significant in defining the character and experience of the Campus as a welcoming and safe pedestrian environment. Ensuring that all buildings provide an attractive and animated face to the open spaces and streets, especially at the ground level, is a priority. The scale and massing of buildings must also be designed to create comfortable and plentiful interior open spaces, to maximize the amount of sunshine and light penetration, and to create a continuous physical and visual relationship with outdoor spaces. 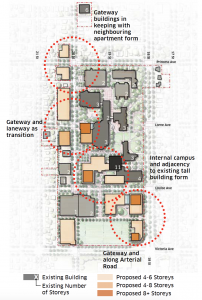 Additional height should be concentrated along the Campus’ streets and the arterial roads – Louise Avenue, 20th Street, Victoria Avenue, and 18th Street. Transition building heights to be respectful of the scale of adjacent buildings, the prominence of key existing buildings, and the proximity to open spaces. Create landmark (tower) forms at prominent gateway intersections for wayfinding – Lorne Avenue and 20th Street, Louise Avenue and 20th Street, Louise Avenue and 18th Street, and Victoria Avenue and 18th Street. Tower building forms should be slim in scale to respect the intimate and compact scale of the Campus and should step back beyond four storeys to create comfortable street and open space environments. Consider the shadow impact on the public realm when determining the appropriate height of a building, especially for tower forms. No building should have an adverse effect on the comfort and use of the open spaces and streets, in terms of shadow and wind effects. Consider appropriate building setbacks and stepbacks to allow for maximum sunlight penetration onto the public realm spaces – plazas, quads, courtyards, streets, pedestrian corridors, and recreational areas. Buildings directly adjacent to the lower density residential fabric must respectfully transition in height or provide a respectful side yard setback to residential properties. Larger building masses should allow for mid-block passageway corridors (to the full width of the building), to allow for connections to key pedestrian circulation routes and open spaces, and to break up the building mass. New buildings along Princess Ave. are more conducive to residential development. Building should be no more than six storeys in height to be in keeping with the character of apartment buildings within the area. All other transition policies should apply.